OMG! Who would have ever thought! 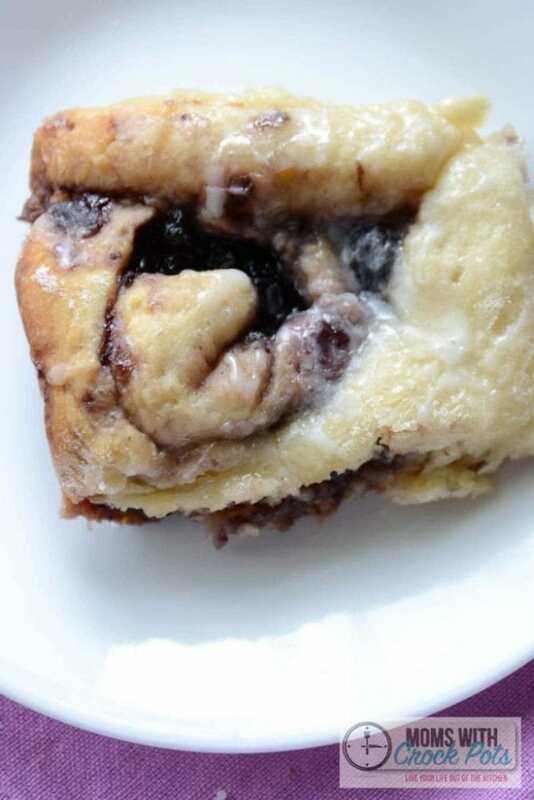 You must pin/print this Crockpot Blueberry Cinnamon Rolls Recipe! It’s amazing! 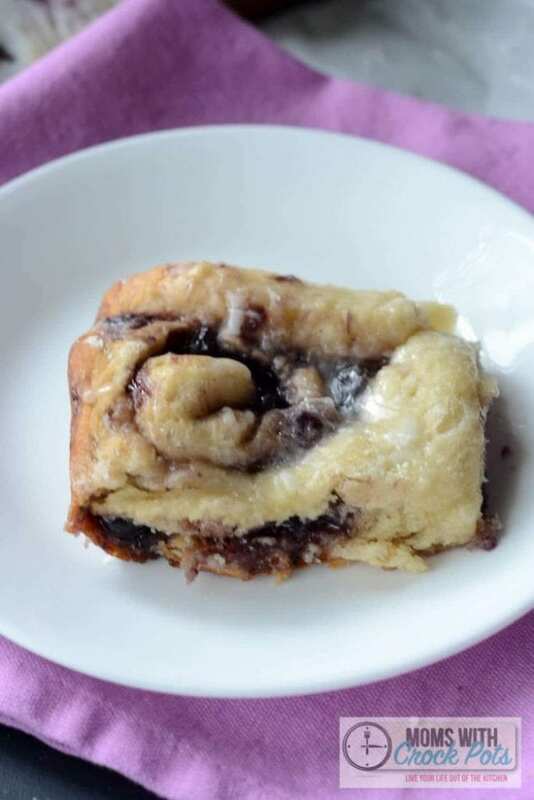 I have the best Strawberry Cinnamon Roll Recipe on my other blog A Few Short Cuts. I have really wanted to try them in the crockpot, but I guess I was chicken. Why mess with a good thing? 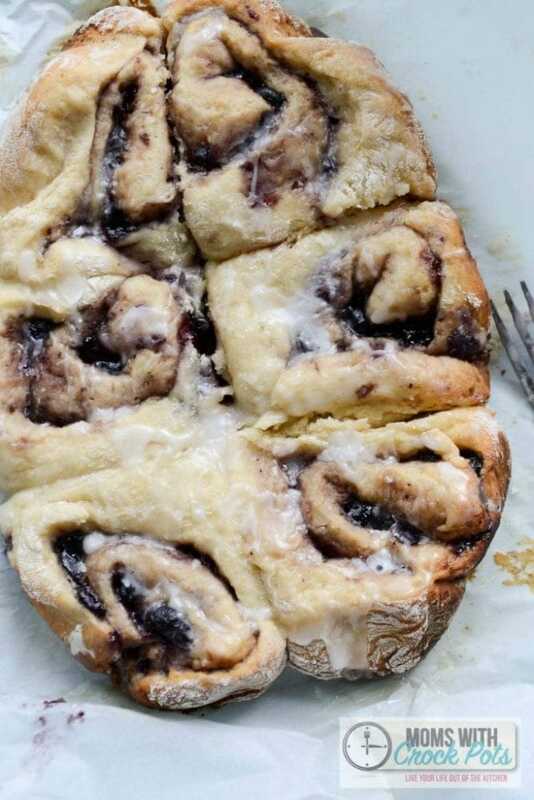 So today was the day, I turned those Strawberry Cinnamon Rolls into these Crockpot Blueberry Cinnamon Rolls and boy am I glad I did. They turned out amazing! I rolled out the dough into a rectangle and spread blueberry preserves over the top. Then sprinkled with a little bit of cinnamon. 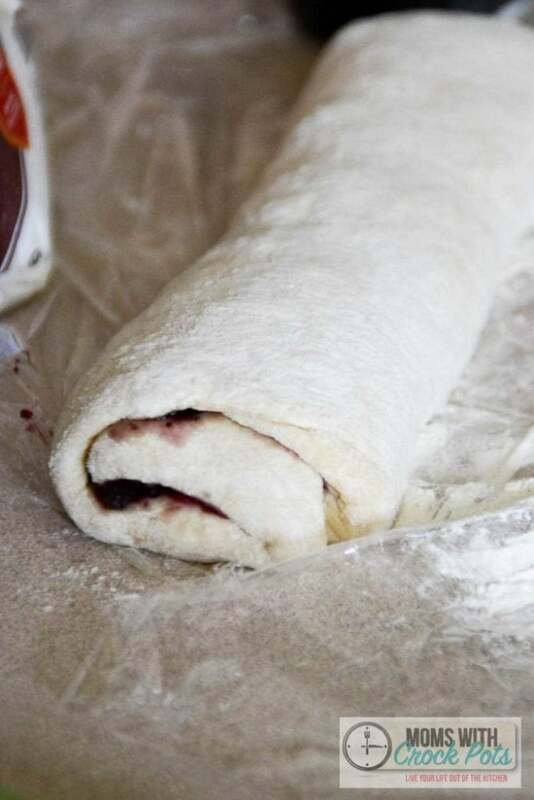 Roll the dough up and slice into 1 inch thick rolls. You should get at least 6 from half of the dough. Now line your crockpot with parchment paper. This just keeps the rolls from sticking and makes clean up and removal a breeze. 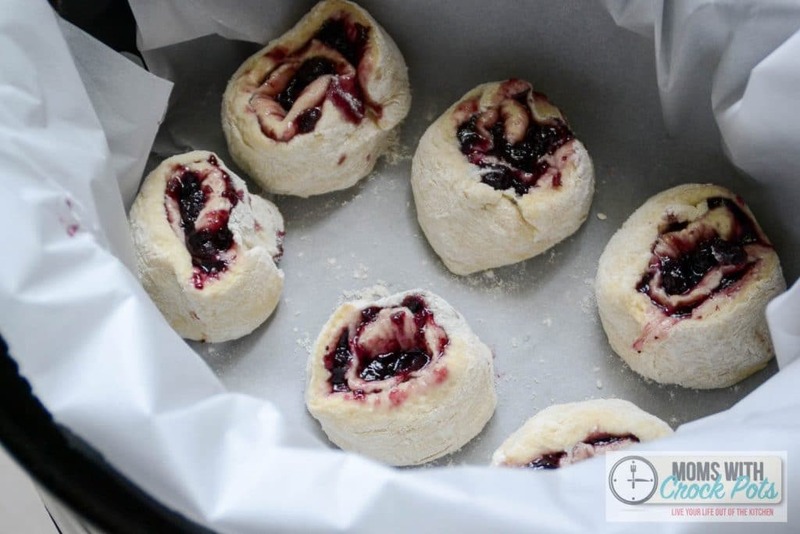 Space out your 6 Blueberry Cinnamon Rolls, place the lid on, and turn the crockpot on high for 1 and 1/2 to 2 hours. Time varies because all crockpots are a little different. I like this method because you don’t have to wait for the dough to rise. It does the rising and baking right in the crockpot. This is what my rolls looked like after 1 hour and 40 minutes. PERFECT! I made a simple lemon glaze with 1 cup of powdered sugar and 1 tsp of lemon juice. If you just want a plain glaze substitute milk for the lemon juice. 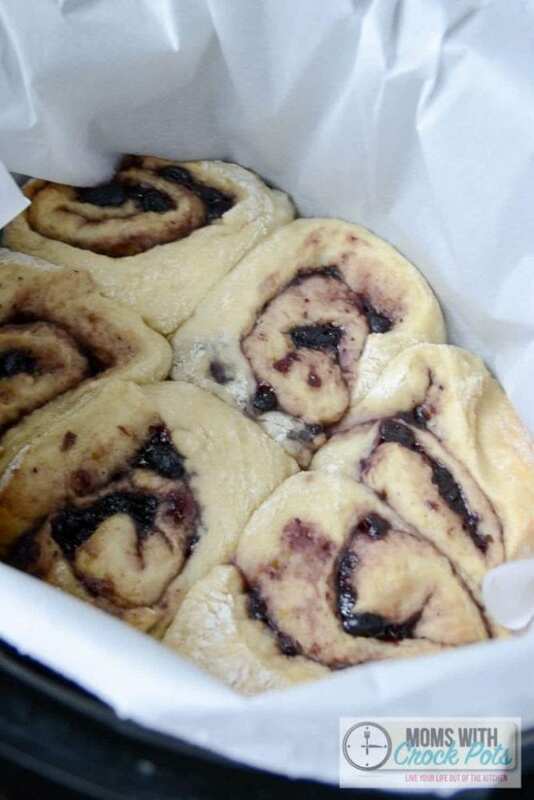 Use the parchment paper to lift your Blueberry Cinnamon Rolls right out of the crockpot and drizzle with the glaze. You are left with a little piece of heaven on a plate! YUM! Split your dough into 2 equal pieces. Wrap 1/2 and put it in the fridge or the freezer for another day. Roll out dough into a 8x10 inch rectangle. 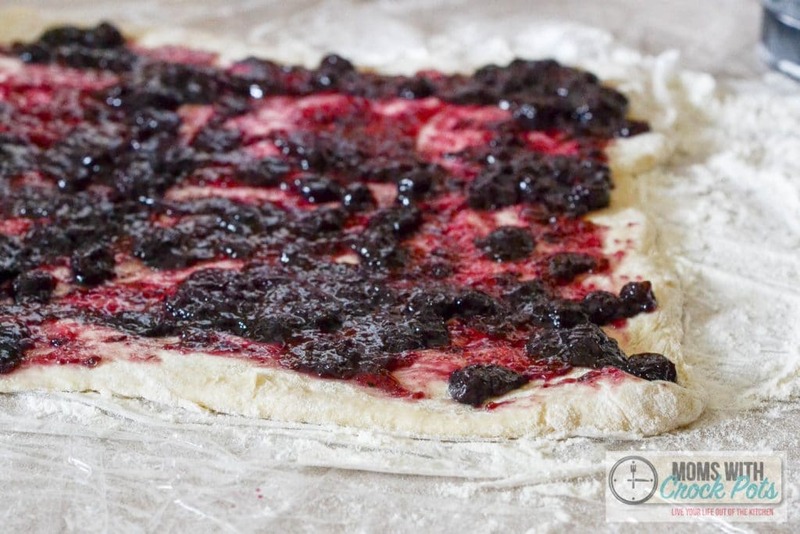 Spread the blueberry preserves all over the dough. Sprinkle with cinnamon. Roll up the dough and pinch the seam to seal. Cut into 6 equal size rolls. Line your 5-7 qt crockpot with parchement paper. Evenly space the rolls as you put them in the crockpot. Cook on high for 1 1/2 - 2 hours on high. Cook time can vary due to the type of crockpot you use. Mix the powdered sugar and 1 tbsp of lemon juice. Stir until glaze forms. You may need to add up to another tablespoon of lemon juice or milk for desired consistency. Drizzle glaze over finished rolls. Substitute almond milk, coconut milk, etc., and a dairy free margarine.